These are the quintessential bad guys that all later bad guys dream of one day living up to. The kind of bad guys that Mumm-Ra aspires to become. What self-respecting child would miss this kind of film? But anyway, a brief explanation for those who are still wallowing in the miseries of brilliant movie deprivation. 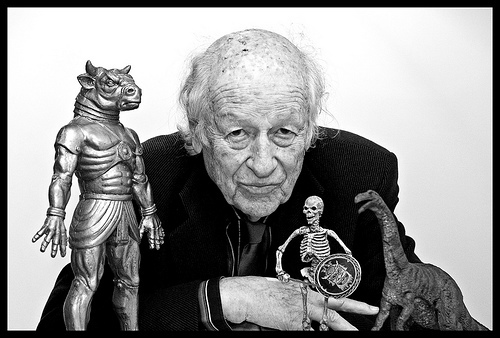 Ray Harryhausen is ONLY the father of modern film special effects. Without his pioneering works it is extremely unlikely that there would be any LOTR films, Wallace and Gromit, or any of the films made by George Lucas. 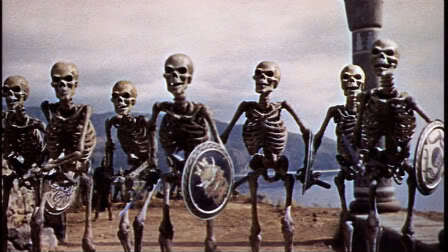 They were all inspired by Ray Harryhausen and their careers were and are fuelled by his creative genius. There are so many animators and filmmakers who owe their careers to this man, and his films continue to be watched and loved by millions of people. His experiments with stop motion animation and his continued refinements to its production have allowed it to survive as a technique still favoured by leading filmmakers. Another admirer, Tim Burton, has been known to pay homage to Harryhausen through various films, most notably, Mars Attacks!. There has been, I am sorry to say, a shameful attempt to re-make Clash of the Titans, which I have seen. I saw it only in order to be able to fully criticise its inevitable shortcomings. The long and short of that is, don’t see it it’s a pile of trash. Obviously some idiotic blockbuster filmmaker who thought he could steal a brilliant film and somehow make it better….? Someone should have told him what he was obviously too stupid to understand – an inferior filmmaker can’t remake a film made by a superior filmmaker and expect it to be better. This is called logic, or just plain common sense. People love Clash of the Titans because it is a wonderful interesting myth adapted to film through the imagination and creative genius of Ray Harryhausen. It isn’t some burly thick-chinned oiks going around being all testosterony and smashing things which is what the 2010 version seemed to suggest. It is a beautiful work of cinematography. I think a lot of recent filmmakers have somehow failed to understand this simple logic. 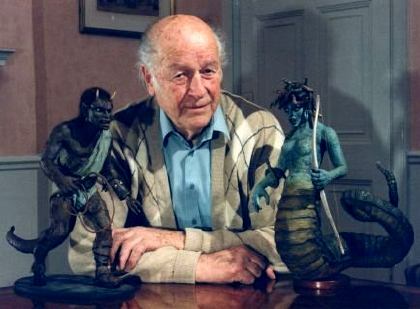 But ignoring that decidedly ignorable film and continuing the Ray Harryhausen extravaganza, watch his films! His creations are brilliant. I particularly recommend Jason and the Argonauts or Clash of the Titans for first time viewers. And if you really like them, go see the exhibition in London. * The Medusa and Talos are actually life-size and absolutely amazing. The smaller Medusa is phenomenal. But the crowning glory has to be seeing the skeletons. They are simply amazing. The detail in their facial expressions and bodies is astounding. You could go and see the exhibition just for them. In fact I think a lot of people did. You could tell where they were because there was a constant crowd of people around that exhibit. This exhibition is really the only reason to go to the London Film Museum (unless you are a fan of Star Wars – then you can see the original light sabers of various characters and such. Of course, Darth Vader had the best one by far. I picked it out as the best one without reading who they belonged to. Far more stylish and practical than the others.). I think the exhibition is on till next June. And yes, if you like the films, or have any interest whatsoever in filmmaking or stop motion animation, it is definitely worth seeing. Here’s a link to his official website. This Medusa is one of the best models on show at the exhibition. Truly a work of art! *There is one rather annoying drawback to the exhibition – all the fat, extremely badly behaved, largely American (yes, I dislike stereotyping too but this was sadly very true when I went there), “kids” who stand in front of exhibits taking illegal photographs, aided by doting parents who haven’t the faintest notion of teaching their children what is and isn’t allowed (as they have been specifically told that the taking of photographs is strictly prohibited. Lucky they weren’t in the Sistine Chapel. They would have literally been thrown out by the eagle-eyed security guards. Probably banned too, and serve them right for not being able to understand basic instructions.) while other parents look on in fascinated horror at this indulgence. Oh well. Happens everywhere I expect. And I’ll be the first to say that there are parents of every class, country, race, colour and ethnic origin who practice the same indulgent lack of teaching the basics of right and wrong to their children. And for the record, it isn’t the children I blame, it’s the parents.